Lecolion Washington, the co-founder and Executive Director of Memphis' PRIZM Ensemble will become the new Executive Director of the Community Music Center of Boston. Washington, who also serves as director of in-school programs for the Memphis Music Initiative, has described the transition as bittersweet. In a positive, forward-looking statement he announced that, "PRIZM’s core values — diversity, opportunity, and access – are much larger than its founders." The Community Music Center of Boston is a 107-year-old nonprofit education hub, " where people of all ages and abilities share music as common ground, and where diversity, expression and self-transformation are the very air we breathe." PRIZM's Director of Operations and Educational Programming Roderick Vester, will serve as interim executive director while the growing classical company conducts a national search for Washington's replacement. Rachel Brun (Luciana) and Claire Hayner (Adriana). 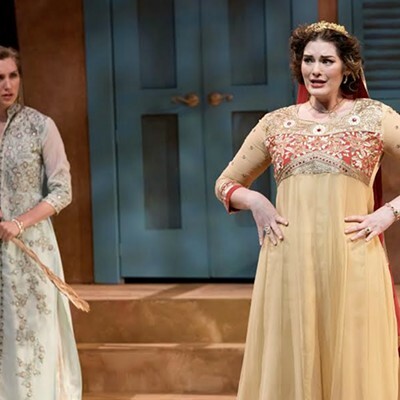 There’s nothing subtle about the Tennessee Shakespeare Company’s production of Comedy of Errors, and I suspect The Bard would have wanted it that way. I’m as big a Shakespeare fan as the next English major, but I had never seen Comedy of Errors produced before. It’s pretty clear that most of the play is just Willy Shakes having fun riffing. 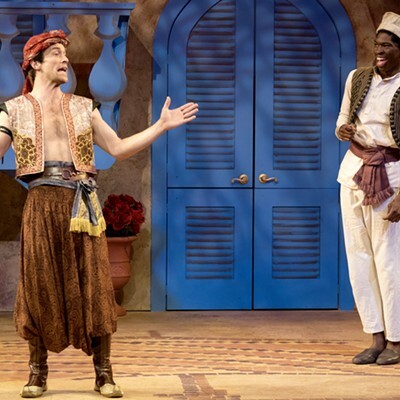 The two Dromios, Syracuse (Blake Currie) and Ephesus (Nicolas Dureaux Picou) take the brunt of the slapstick violence meted out by their increasingly flustered masters Antipholus of Syracuse (Joey Shaw) and of Ephesus (Colton Swibold). Among director Tony Simotes’ more interesting experiments is the casting of the twins. Shaw and Swibold share a strong resemblance, but their characterizations mark them as quite different people. Shaw’s Syracusian brother is bold and not a little mischievous, while Swinbold’s Ephesian Antipholus is a decadent noble elevated by good connections with the Duke (Stuart Heyman). The Dromios, on the other hand, are completely different physically while being functionally nearly identical in character. All four male co-leads (I guess that’s what you’d call them) acquit themselves admirably, as do the always great Phil Darius Wallace as Egeon, the father of the two Antipholuses whose imminent execution by the Duke provides the comedy’s ticking clock tension. On the distaff side, Ephesian wife Adriana (Claire Hayner) and her sister Luciana (Rachel Bruin) serve as capable straight women for the increasingly convoluted comedic conundrums. 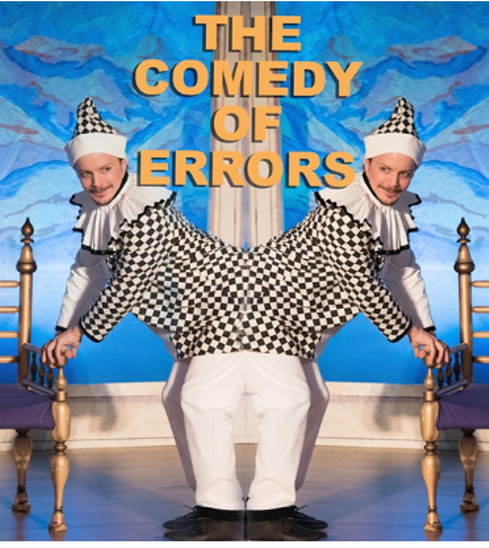 Comedy of Errors is one of Shakespeare’s earliest works, but the plotting is amazingly tight. The playwright throws gags fast and thick, and isn’t about to wait around for you to get the jokes. The players have the unenviable task of breaking through the smartphone addled modern brains of the audience who are likely struggling with the cognitive overhead of interpreting Elizabethan English on the fly. Director Simotes has his cast going big, telegraphing the gags, giving everything the hard sell. Combined with the Ottoman themed stage dressing, it gives the proceedings the feeling of authenticity. I can’t imagine Dromio of Syracuse’s extended fat joke was delivered with much subtlety to the groundlings in 1594. And let’s face it, despite what sounds like flowery language today, none of these characters are terribly bright. Thanks to the performers’ energy, TSC’s Comedy of Errors is an entertaining romp. Two sets of identical twins and their parents are separated at birth. 20-years later they wind up in the same city in one of Shakespeare's wildest romps. Tennessee Shakespeare Company sets it all against the backdrop of 17th-Century Grease. 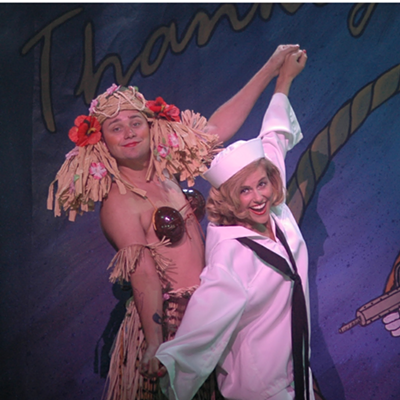 South Pacific's a peppy musical and liberal touchstone — a Greatest Generation romance set in WWII's Pacific theater and stuffed with 20th-Century standards in almost every sense of the word. But contrary to what the show's famous song says about racism, when it's so systemically ingrained audiences easily mistake the fetishization of submissive Asian girls for tragic romantic love, it has to be carefully untaught. Otherwise it perpetuates with the aid of broadminded heroes like Rodgers & Hammerstein's Emile de Becque, the French planter who says all people are equal and totally had kids with a Polynesian woman but still parties with peers who pay indigenous laborers so little they need American soldiers to harass the competition. 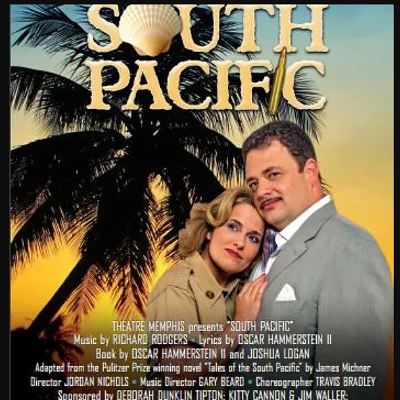 To borrow an obvious but useful line from New York Times critic Ben Brantley, "few things in showbiz date more quickly than progressive politics," and today South Pacific — progressive to the point of being scandalous when it landed on Broadway in 1949 — plays out like U.S. Imperialism the Musical! South Pacific has always been a conversation piece. Its creators fought hard against fierce pushback to make it so, and in that spirit Theatre Memphis' production feels like a sparkling blue souvenir from a far away land — old and brittle in places, but kept in good condition to pass on to the grandchildren. The musical's frame is naive but sophistication is evidenced in the character of Nellie Forbush a spunky self-described optimist who only sees the best in the world until she finds out the man she loves once loved someone of another race. Her racism is as naked as she is in the musical's pinup-inspired shower scene. 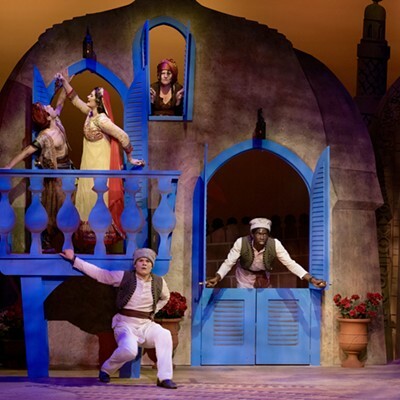 It's as fine an example as the musical theater provides of otherwise good people unable to recognize their own prejudices, and ironic in an expansionist-friendly narrative girded with orientalism. Will Nellie really wash that miscegenationing Emile right out of her hair? Is extravagant romance in an exotic location with plenty of champagne a meaningful gateway to other kinds of love and tolerance? South Pacific remains vital because, like Nellie the lover who discovers she's a hater in a personally jarring revelation, its ideological shortcomings are so vulnerable, begging for critique, conversation and correction. Bloody Mary: Based on a real Tonkinese woman who led a revolt. Theatre Memphis dares to be garish and when the community playhouse rolls out its big musicals extravagance pushes elegance under the wheels time and time again. Not so this round and even director Jordan Nichols trades his choreography-heavy style for restraint. 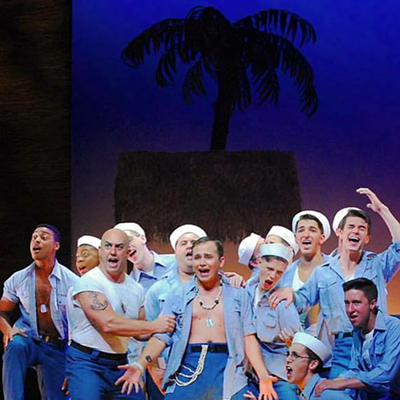 In this South Pacific, relationships matter more than razzle dazzle. As a result "dames" keep their dignity, and so does the musical's Mother Courage character, Bloody Mary. Often presented as a Tonkinese cartoon hawking her trinkets and cursing in broken English, Mary's easily criticized for selling her underaged daughter. In the context of privation, war and isolation it's not so hard to see the caring mother trying to get her children out of the plantation system the best way she knows how. I can't say there's any real spark between Kent Fleshman's Emile and Amy P. Neighbors' Nellie, but great voices and emotional vulnerability add up to great performances. Noby Ewards sings and acts Bloody Mary beautifully, never allowing the profit-minded character to become a gag. Oliver Pierce makes the hustling sailor Luther Billis an affable clown, and Bloody Mary's all-American counterpart. Bradley Karel cuts a heroic profile as Lt. Cable, without hiding any of his doomed character's flaws. Ensemble characters are perfectly cast, sacrificing finesse for verisimilitude to great effect. But the real stars here are the songs: "Cockeyed Optomist," "Some Enchanted Evening," "Bali Ha'i," "Wash That Man Right Out of My Hair," "I'm in Love With a Wonderful Guy', [DEEP GASPING BREATH] "Younger than Springtime," "Honey Bun," "This Nearly Was Mine" — and the list goes on. All of them perfect, and perfectly presented with lots of heart and little fuss. South Pacific may not be the groundbreaking progressive statement it was in 1947. Nellie's proud Little Rock heritage will never be as bracing as it was when the film came out in 1958, months after Federal troops rolled into Arkansas to integrate Little Rock Central High. Today a script once described by right-wing critics as a tool of Moscow is more likely to be criticized by the woke left. But for all of that, it holds up better than so many mid-Century musicals, wearing its flaws more like scars than medals. Even in 2017, it wants to foster more than just a bunch of "Happy Talk," and that makes this artifact a keeper. Why hate when you can love and exploit? Musical theatre doesn't get more bedrock than Rodgers & Hammerstein. Take a gander at what Theatre Memphis is doing with one of the duo's most celebrated classics. Orpheum CEO Brett Batterson was playing on a neighbors porch in Davenport, Iowa when an unfamiliar black car pulled up in front of his parents house, and two men in suits got out. The news they brought was bad. Batterson's father had died of a massive heart attack. He was only 30. Batterson was 7. Years later, as CEO of the Auditorium Theater in Chicago, and with that terrible day in mind, he launched Hands Together, Heart to Art, a one-of-a-kind theater camp for kids who shared his experience of having lost one, or both parents. "I realized that involvement with the arts and the theater specifically gave me a group of friends I could rely on," says Batterson, who grew up in a creative household with a puppet theater in the basement. "It gave me a place to express myself creatively, and it gave me self-confidence. One of the biggest things councilors see in kids who’ve lost a parent is a lack of confidence." He wanted to replicate that experience, as much as possible, for as many kids as he could reach. Now that he's in Memphis, with the full resources of the new Halloran Centre at his disposal, Batterson has announced the arrival of Mending Hearts, a similar camp, with similar goals, but a different approach. "When we were talking to Blue Cross/Blue Shield about funding they said they were interested in programs that had a health aspect," Batterson says. "And I said, well, here’s this one program that we’ve talked about bringing from Chicago. I don’t want people to think we’re doing it just for the funding because this was already on my mind. But that was the motivation." Mending Hearts is inspired by "the soul of the Chicago camp," according to Batterson. "But it’s different in a few ways," he says. "One of the things that’s different here is that we’re focusing more on the art for art’s sake, and letting some of the healing that comes through creative expression happen more organically than we did in Chicago. Although the counseling is vitally important it will be used to support what they’re doing in the classroom." A typical day at Mending Hearts camp will include music, acting, and dance classes, visits from guest artists, and time for the campers to bond and share stories. "The hardest part of the first year is just getting the word out and getting campers," Batterson says. "After that word of mouth takes over." Application Deadline: June 26, 2017 or until all spots are filled. Before and after extended care available and lunch and snacks provided free of charge.